Crates can be tricky, especially for large dogs. It’s absolutely critical that they have enough room to feel comfortable. Sure, small breeds need space as well. However, small breeds are, well, small. They don’t need as much space are large breeds. We have a few recommendations of good dog crates for large dogs that you can use; however, we’d like to cover some general tips and tricks before we get into that! **Below, you'll find our more detailed reviews; you can also click the links above to check prices or read customer reviews on Amazon. 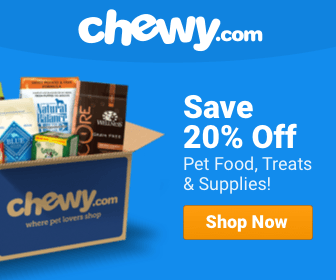 What to Look for in a Dog Crate for a Large Dog? There is quite a bit more to look for than people think when it comes to dog crates. Some crates can be made with inexpensive materials or poor designs, leaving your pup uncomfortable and ultimately unhappy. One of the glaring benefits wire cages are the fact that they are easy to transport and store away. This makes them idea for people who travel a lot with their pets or only use the crate occasionally. Another great thing about the wire crate is that it is easily adjusted for size. You can expand and resize the crate as necessary. This is a fantastic element for a growing dog. It’s great for large breeds as well, and it might end up saving you money in the long run. There are tons of great benefits of plastic cages. In addition to giving your dog a greater sense of security and privacy, they’re actually required by law if you’re going to travel with your dog by plane. So if you think there may be a chance in the future for you to travel by plane, it’s actually mandatory that you buy a plastic crate for your dog. However, that doesn’t mean this crate will have to be a full-time crate for your pup. Wood crates have a few benefits. They look really great for starters. Also, they’re very strong and secure. Also, the top usually comes with a flat, wood surface that you can put things like books, centerpieces, etc. Soft side crates are good for dogs that aren’t very aggressive about getting out of their crate. They’re fantastic for traveling, camping, and using outdoors. They can be “pitched” at a moment’s notice. I think it also feels less threatening to dogs in some cases. If we can put ourselves in the cage for a moment, it’s much less threatening to be in a fabric cage than behind metal bars, but ultimately, it’s about you supporting your dog when it gets into its crate. Another thing that is important to consider is the size of the crate. This is absolutely crucial because if a cage is too small, it’s inhumane, it doesn’t give your dog ample room to move about freely. If a cage is too large, however, your dog could isolate itself to a corner. This is especially true while your dog is going through the “puppy” stages. 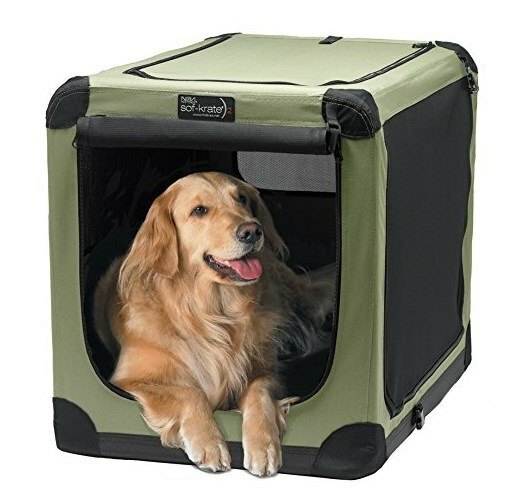 This is a very standard, very sturdy crate for your dog that will work great for a large dog. 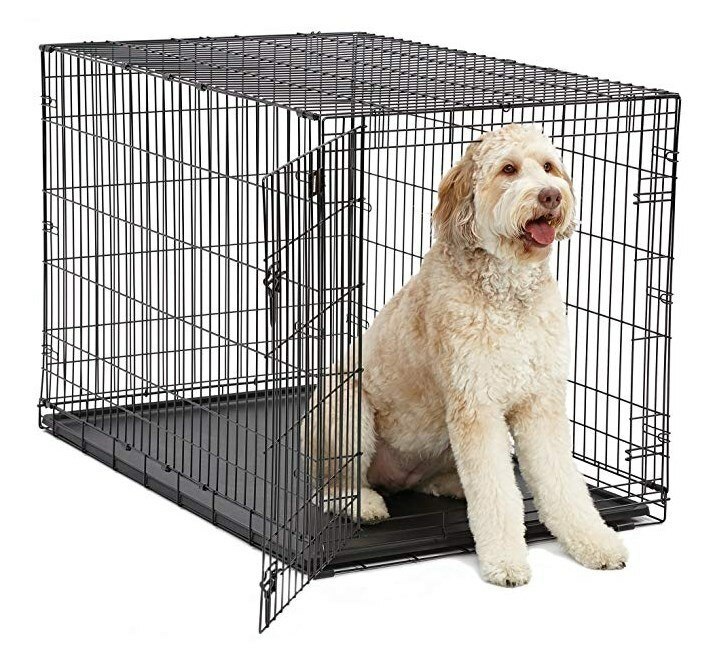 The largest size is 48” and if you hapzpen to have a smaller, secondary dog, the crate sizes go all the way down to 18”. It comes with a divider so if you get the cage for a puppy who is going to get larger, you don’t have to worry about it being overwhelming for him. This crate also comes with a single door, a composite plastic pan, and a bolt latch for added security in case you have problems of the puppy trying to bail out! The official measurements of this crate are 48 x 30 x 33. So it’s definitely large enough for your beloved pup! This is a different sort of crate, but we feel it’s important to include it. This type of dog bed is excellent for travel. It can be used as an indoor or outdoor bed if you’d like, but its best suited for travel use and outdoor use. It’s a sizeable crate as well; its official measurements for the large crate come in at 42 x 28 x 31. They do have smaller versions available if needed for a second pup, but this one will likely be sufficient for your large dog. Also the crate can support dogs up to 90 lbs. 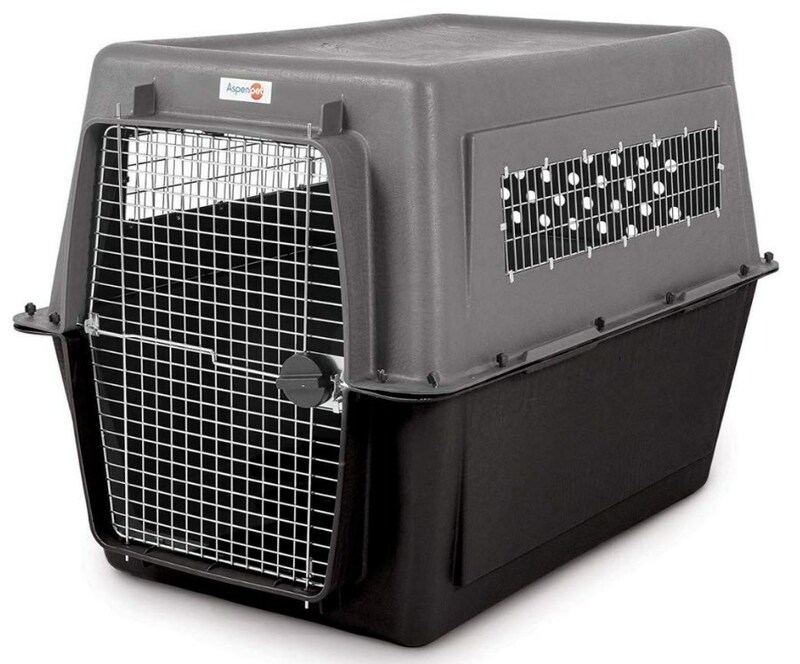 Additionally, the crate is well-ventilated with tough mesh fabric, and it can set up anywhere you’d like in seconds. We’re pretty excited about this one. Above all, it’s just a slick looking piece. It’s made of dark, natural, forest wood, and it’s a good size for your large breed dog. The official measurements of this crate are: 36 x 24 x 29.25. Also, it’s really great because it can fit in with the other furniture in the residence. A lot of time, even though they are necessary, crates can be a bit tacky looking. Additionally, it comes with a 90 day warranty which is a nice safety net. If it doesn’t work out within that period, you can simply get it replaced, but I think you’ll be happy with the product. This is another great metal crate. It comes in all different sizes for all types of dogs; however, the large crate is great for your large breed dog. The large crate officially measures at: 42 x 28 x 30. It’s also effective for dogs up to 90 lbs. It’s also sturdy enough for even the strongest of dogs. A lot of dogs are known to try to get out of cages at any cost, this includes bending the wires. The wires on this crate are not likely to be bent by your pup. Additionally, the crate comes with a divider panel, which is great for puppies that haven’t quite grown into the size of the crate. It also comes with a training guide and a removable plastic pan. 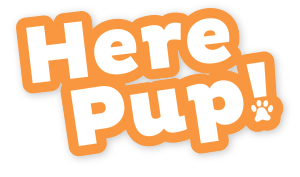 This will definitely come in handy during the puppy stages when your puppy might be more prone to having accidents. This is the only plastic crate that we’re reviewing, but that’s not because we have anything against them. This is a great crate, and it’s massive to boot. 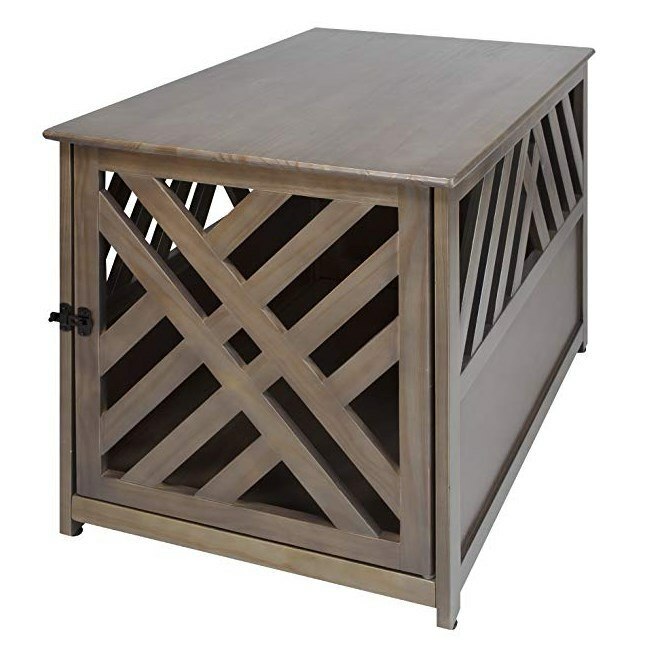 The official measurements of this crate are: 48 x 32 x 35, which makes it the largest crate that we have reviewed. 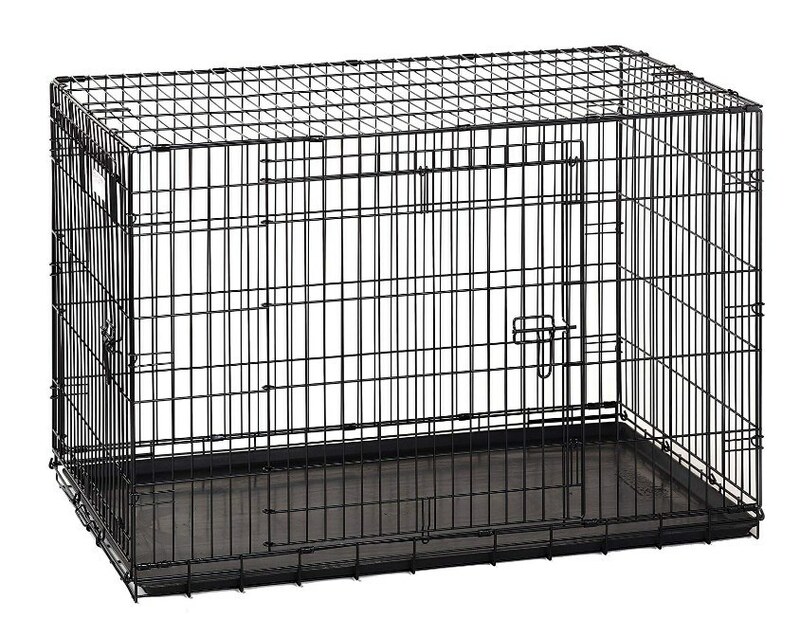 However, if that’s a bit too large, Petmate also makes a dog crate that is a bit smaller than this one, but still pretty large. This crate meets airline requirements, which is a great security to have (you never know when you’re going to have to jet on a moment’s notice.) It’s also great for road trips and short trips to the vet’s office. Overall, we highly recommend it! Overall, it’s always great to have a crate on hand, even if you aren’t someone who crates their dogs often. You never know when it’s going to be necessary. Also, if you’re someone who lives away from family, it’s especially important to have a crate in case you aren’t able to get anyone to watch your dog while you’re gone. Each style has its advantages and disadvantages, but overall, it’s best to gauge your needs with your dog’s needs and go from there. Lastly, getting any dog use to a crate takes plenty support from its owner. If you just toss your dog in its crate, it generally won’t respond very well. Best Dog Clippers for Cocker Spaniels: 5 Amazing Tools to Trim That Pup!